Looks great when it is together with the other blocks. Makes a great table runner! 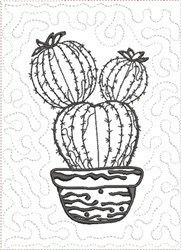 Create a one of a kind Southwestern quilt with this ITH cactus design! Use it as a centerpiece or combine with other designs! Pat Williams is happy to present ITH Cactus to Color Quilt Blk 5 machine embroidery design which has 11393 stitches and is [123.19 mm x 173.99 mm] large. If you would like to view more embroidery patterns please search on our embroidery designs page.